You can delete any clinical note from a patient's record unless that note has been marked as having been reviewed. On the Patient menu, under Clinical, click (or tap) Progress Notes. 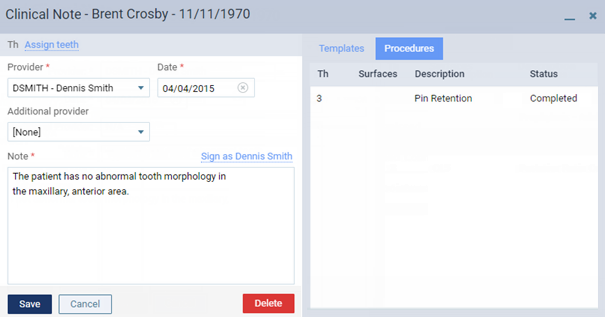 The patient's clinical record opens with the Progress Notes tab selected. On the Progress Notes tab of a patient's clinical record, the procedure history for the patient appears. Select a clinical note. On the Chart, Progress Notes, Quick Exam, Treatment Planner, or Perio tab of a patient's clinical record, on the Clinical Notes button menu, select a clinical note. The Clinical Note dialog box appears.